A trip to emergency with my baby was a shocking reminder of how easy it is for curious crawlers to get injured once they have the skills to investigate their way around the home. No matter how careful you are, those bubs can be mighty determined to hurt themselves at times but after the close call I’ve just had, I will be taking some extra precautions. I’m not sure whether it’s because I had a bit of a gap with my last baby and have forgotten how hard it is to stop curious crawlers from getting hurt, or whether my bub is particularly full-on and incredibly inquisitive; but either way it’s exhausting and stressful trying to constantly avoid potential disasters. Choking – he puts everything in his mouth and as hard as I try and make sure there isn’t anything small like Lego lying around, there’s always something for him to find, pop in and almost choke on. Old bits of food under the couch his brothers have dropped, pen lids, toy soldiers, hair, Hungry Hippo balls, rubber bands, cat biscuits, coins – the list goes on. Things falling on him – whenever I go to the pantry he’s right there with me and numerous times heavy tin cans have fallen out only narrowly missing his head. Also because he can now stand (when holding on to something) he often reaches up for things and pulls them down on to himself as well, like books and remote controls. Fingers being trapped in doors – closing doors to cupboards and rooms like the bathroom are necessary of course because of the potential dangers, but often in my haste to shut them I almost trap his fingers. They did actually get caught the other day when I was putting clothes away in drawers and his tiny hand shot out before I realised it was there – terrible. 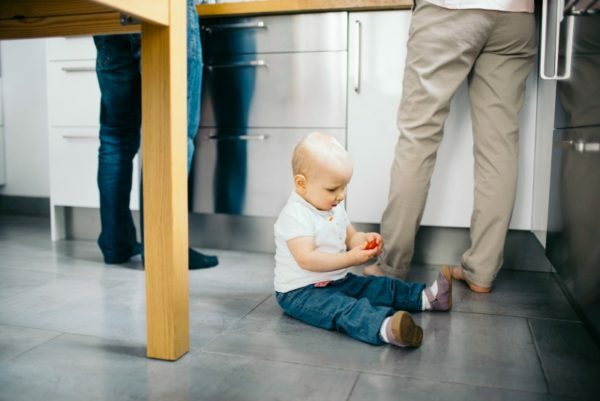 Being stepped on or pushed – it can be pretty busy and noisy in my house (three boys after all) and often my baby is in the middle of toys and whatever else on the floor with his little hands in prime position for being stepped on. 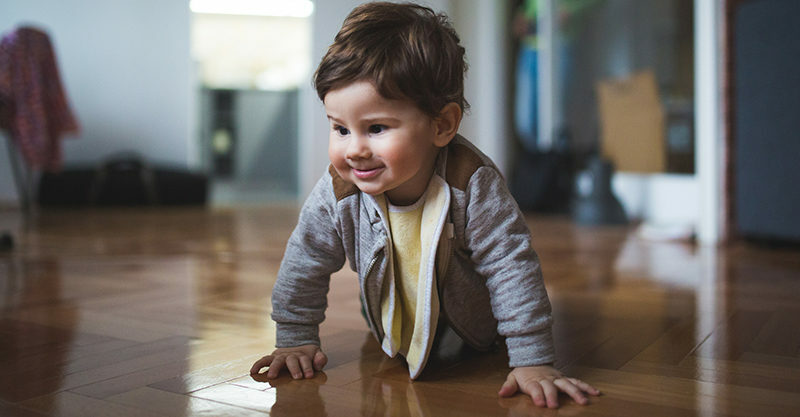 The other boys also run around the house and without meaning to, almost knock him into walls and furniture as he’s very unsteady on his feet and so small still. A lot of the time my baby is under my feet or holding on to my legs while I try and do things around the house, which I didn’t think too much about until it landed him in hospital. I was making dinner in the kitchen when his exploration at my feet threw me off balance, causing me to drop a very sharp knife on the floor, slicing his finger in the process. There was so much blood, he was screaming, my other boys were crying and so was I – it was terrible and my husband wasn’t home. I managed to stop the bleeding and head to the hospital where they glued the cut. In this instance I was incredibly lucky because he didn’t even require stitches, however I know that this could have ended up much worse – what if the knife had cut his eye or face, or his finger had been sliced off completely? I can’t even bear to think about it – so very frightening. Trapped and crying – better than being unsafe! In light of this scary incident I’m now taking a few more precautions around the house. On top of the usual rituals of removing small objects off the floor, closing dangerous cupboards and rooms, cutting food into small pieces, blocking access to wires and making the other children more aware of him; I’ve decided to limit his crawling when I’m in the middle of an activity that involves things that could be harmful or occupies me too much. From now on he will be safely strapped into a highchair – no matter how much he protests – when I am cooking. Listening to his cries of frustration at having his freedom curbed is better than another trip to the hospital. The same goes for when my focus is on something else, because I can’t stop the cat from scratching him (after he’s been smacked non-stop by my baby) if I’m not paying full attention right? 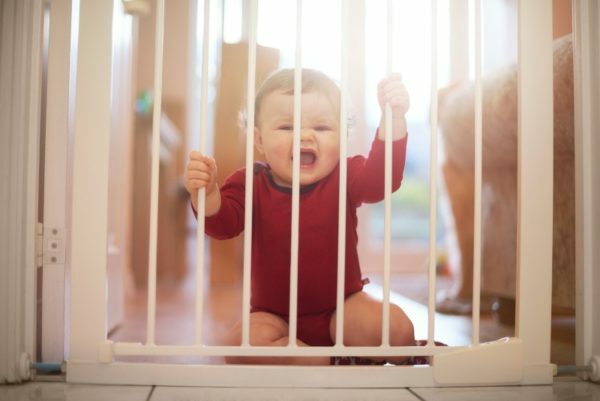 Better to pop them somewhere safe; a playpen, baby gates or even the cot are also other good options, rather than risk something really bad happening. Does your baby get into near scrapes constantly? How do you avoid disasters with your crawler?